Another Christmas card to add to my stack...December will be here before we know it! And a little tin becomes a hot tub for the dog! Enjoy your day! So glad you are back and the mojo is working. Missed your beautiful cards. What a handsome deer, and darling dear!! Welcome back! I think you're mojo looks rested and working well or me! I love that deer and your combo of DSP. It looks so rustic and Christmasy. Cassidy is always busy! Welcome back, I missed you!! This card is perfectly masculine with the plaid, woodgrain and deer. Very cool. I do love Cassidy's imagination, she's so darn cute! Hope you had a great time & glad you're back!! I love the rustic look of your card! And Cassidy always gives me ideas of fun for Emma! Tolle Karte und super Umsetzung ! 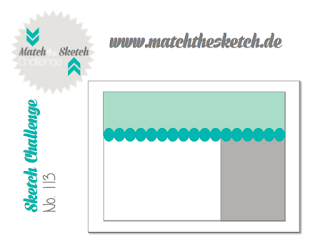 Vielen Dank für Deine Teilnahme bei Match the Sketch.